Is Your Traffic Being Diverted by Paid Search Ads? Companies count on their signature products and services to draw crowds into their brick-and-mortar stores as well as Web traffic to their websites. However, when their trademarks and signature products are being used in other vendors ads it can draw attention away from their stores and ads and to the other vendors. BrandVerity, a service that detects online brand and trademark abuse, has announced the release of a new study titled "The State of Branded Keywords in Paid Search Q3 2014." During the course of the study BrandVerity evaluated how core branded keywords of more than 250 popular, consumer-facing brands from 10 industry categories were used in paid search. One of the most interesting findings from the study was the ranging difference between search engines regarding brand ads versus non-brand ads (ads that brands placed themselves compared to ads competing advertisers placed using brands trademarks). 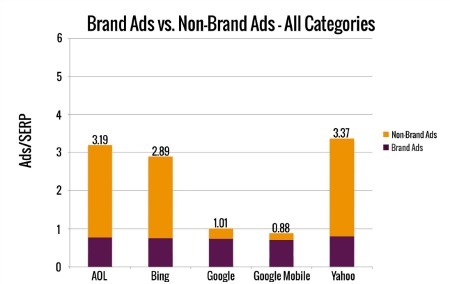 Of the five search engines that were monitored (Google, Google Mobile, Yahoo, Bing and AOL) Google and google Mobile had the lowest amount non-brand ads. Another interesting finding from the report was the amount of non-brand ads in the Clothing and Apparel industries. Part of what makes this industries findings so interesting is that even on Google there was more than a 30 percent chance that ads on search engine results pages (SERPs) were from non-brand sellers using brand trademarks in their ad copy.